Pakistan strengthen its hold on the Test series, after a fluent double-century from Younus Khan and a vintage ton from skipper Misbah-ul-Haq ensured that Australia are nowhere around them at stumps on Day 2 of the second Test at Abu Dhabi. Earlier, Mitchell Starc got Australia an early breakthrough when Azhar Ali (109) was trapped by the former after smashing a remarkable century. 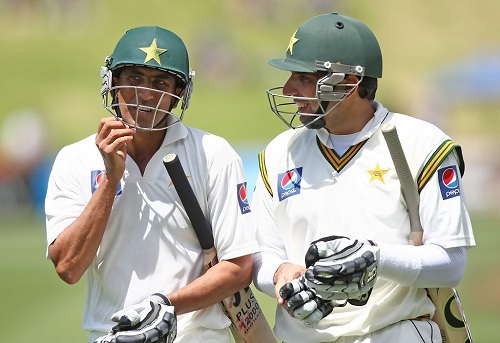 Misbah, then, exhibited a solid blend of tranquillity and hostility to ably support Younus, and the duo went on to achieve personal milestones. However, Misbah’s (101) spectacular innings came to an end after he was caught and bowled by leg-spinner Steve Smith and subsequently, Younus (213) perished while trying to score runs in a jiffy. Starc got his second wicket of the match after Asad Shafiq (21) went off while trying to cut a closer delivery, and ultimately, Pakistan declared their innings at 570-6. With just a few overs left in the day, the onus was on Australia openers – David Warner and Chris Rogers – to hold on and not let any wicket fall further. However, it seemed that fate was not on their side as Rogers (5) departed to Imran Khan in the 5th over of the day, forcing Australia captain Michael Clarke to send in Nathan Lyon as the night watchman. The visitors finished the day off at 22-1 and still trail Pakistan by 548 runs.